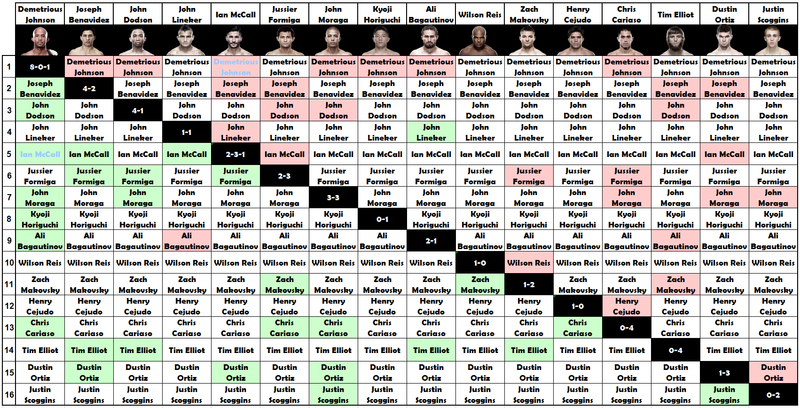 Since I posted my last UFC Rankings in September there have been only 2 UFC events, and 22 fights (including 1 title fight). 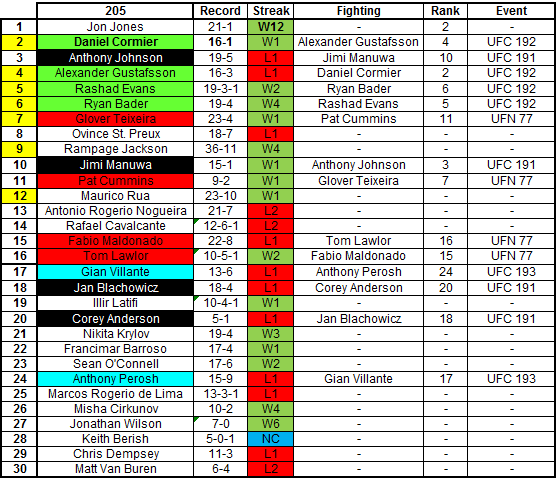 In the past month we saw an epic battle between two of the best Light-heavyweights of all time. Champion Daniel Cormier and Alexander Gustafsson put on one of the best championship fights of all time back in UFC 192. There was also a small show in Dublin on October 24th, and while the fights were fun to watch, the card was so injury plagued that there weren’t really any big ranked fighters who fought that night. 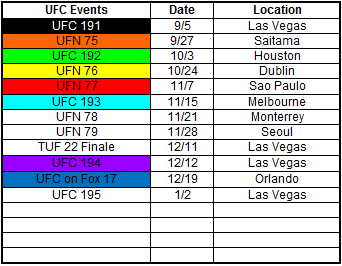 October was a bit of a slow month for the UFC, but that’s okay because there are 4 shows scheduled for November and 4 shows scheduled for December so we should see a lot of movement in the rankings in the upcoming months. 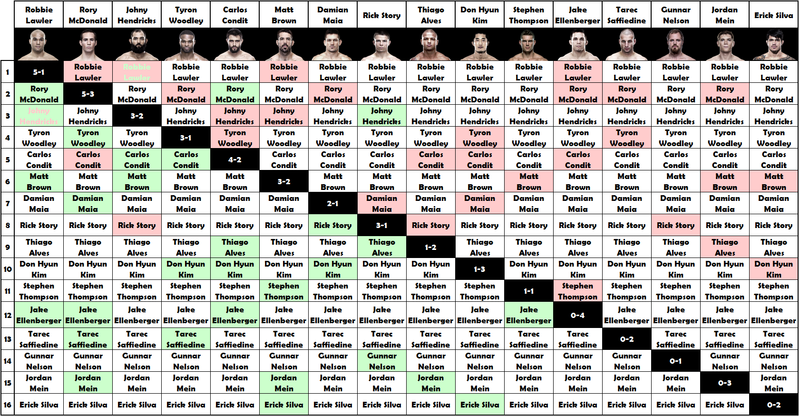 I’ve added a new feature this month. From now on fighters in the top 16 that are fighting each other will have their names highlighted in the same color in the matrices. 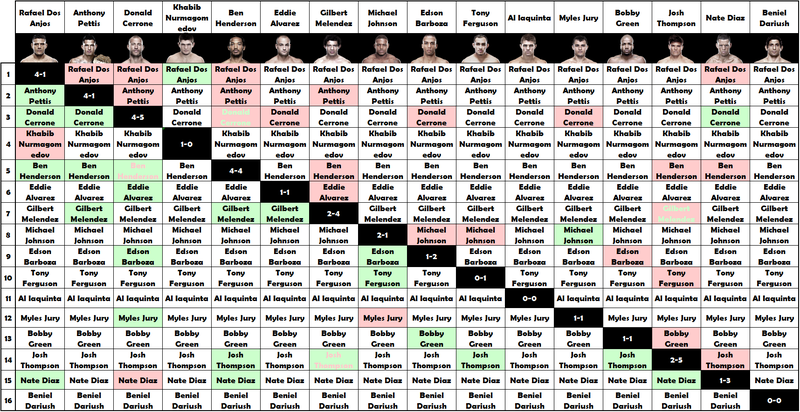 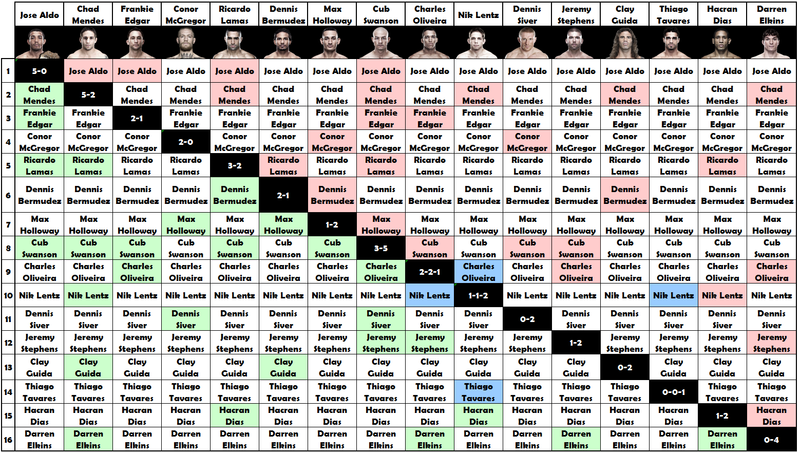 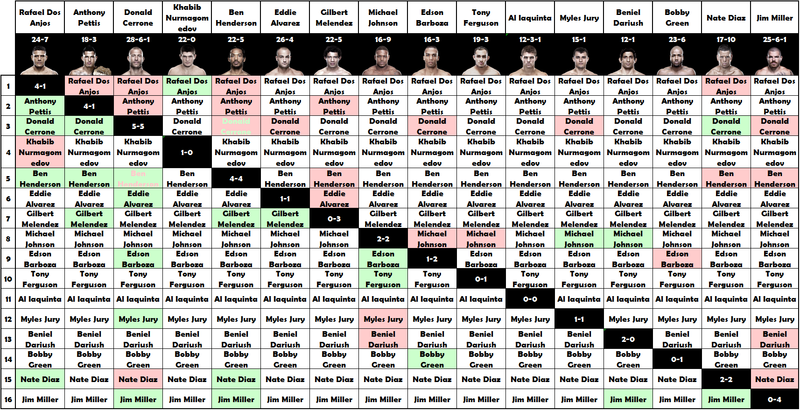 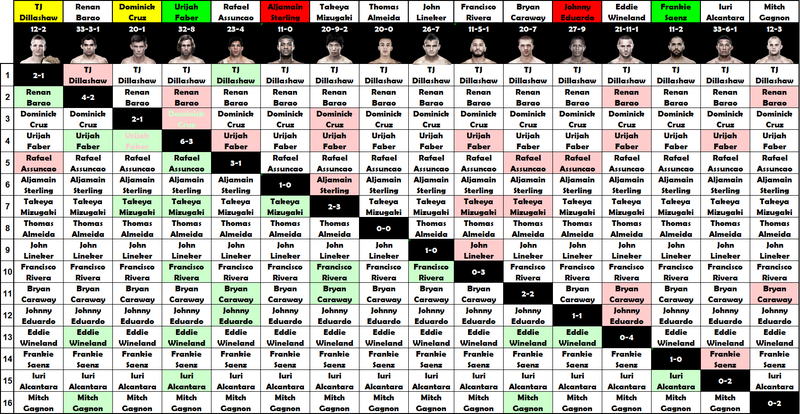 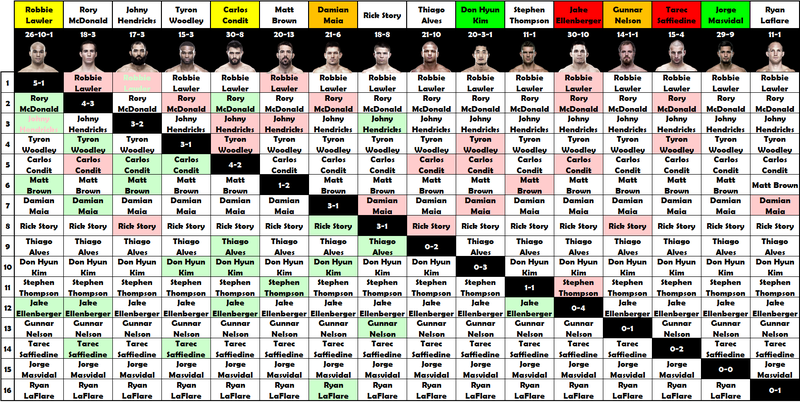 Since I posted my last UFC Rankings Matrix in June there have been 7 UFC events, and 77 fights (including 4 title fights). 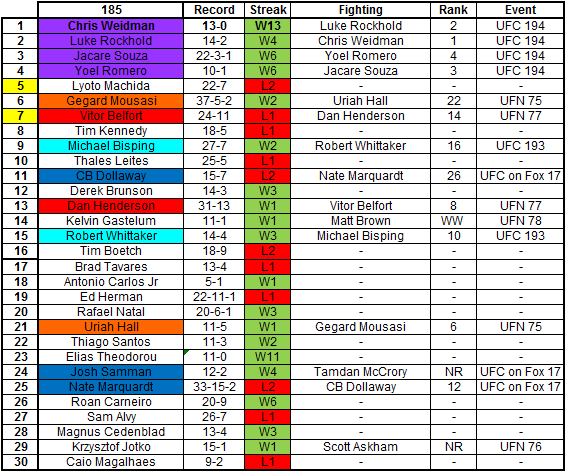 In the past month we’ve seen the crowning of a new UFC Heavyweight Champion in #1 Fabricio Werdum. We’ve continued to see the rise of the destructive #1 Joanna Jedrzejczyk, and we witnessed arguably the greatest UFC event of all time in UFC189. An event that featured the crowning of #2 Conor McGregor as well as the fight of the year between #1 Robbie Lawler and #2 Rory MacDonald. * I included the fights from the 20th Season of the The Ultimate Fighter even though they were technically “Exhibition” matches because they were part of the tournament that crowned the inaugural champ. 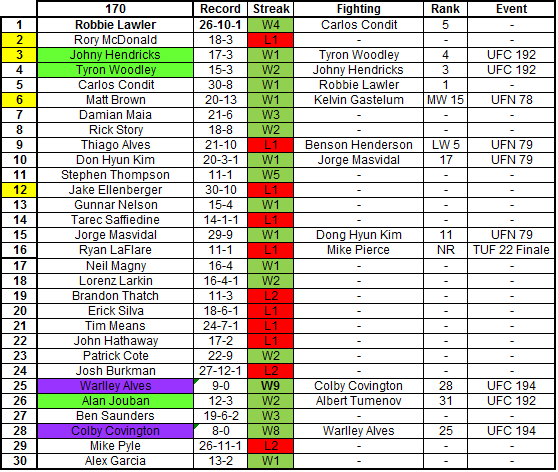 There has been a ton of great UFC action in the past month. Since I posted my last Rankings for the month of May (HERE) there have been 5 UFC events, and 59 fights (including 2 title fights). In the past month we’ve seen #4 Stipe Miocic cement himself as the future of the Heavyweight Divison by absolutely destroying the great #7 Mark Hunt. 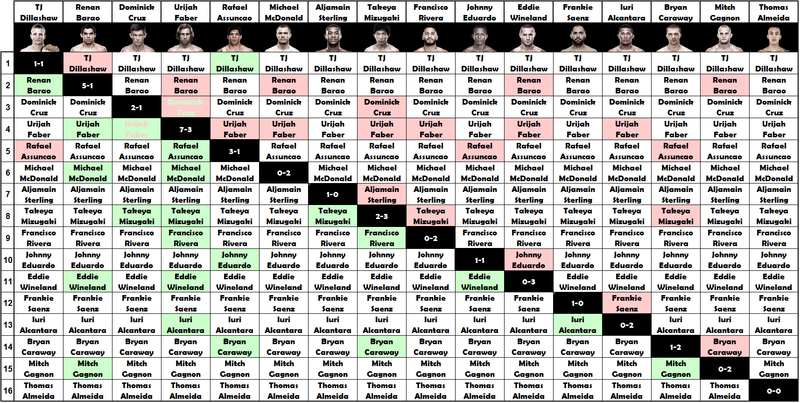 We’ve witnessed the crowning of a new UFC Lightheavyweight Champion in #2 Daniel Cormier and we’ve seen some MMA legends come back and pick up some much needed finishes (#5 Carlos Condit & #15 Dan Henderson). 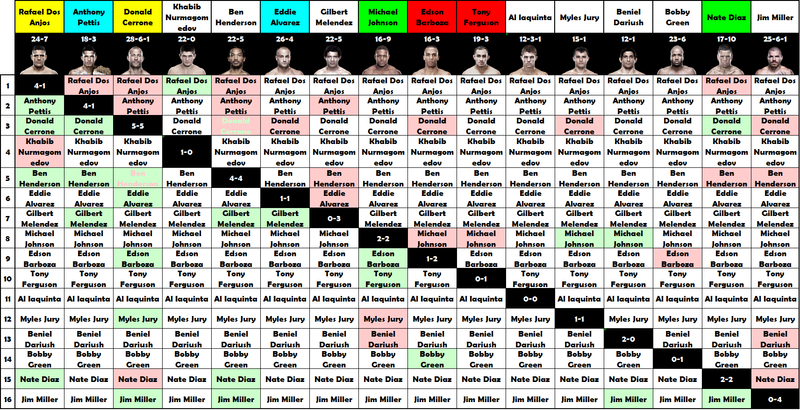 Not to mention the very underrated superfight between #3 Frankie Edgar and #4 Urijah Faber. 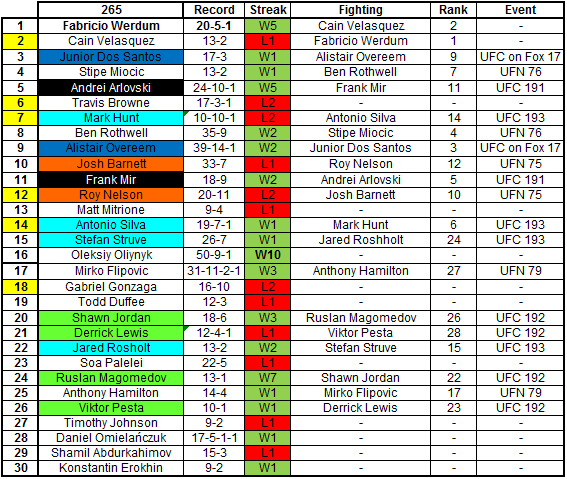 All in all these past 30 days have given us some fantastic fights and there has been plenty of movement in the rankings because of it. 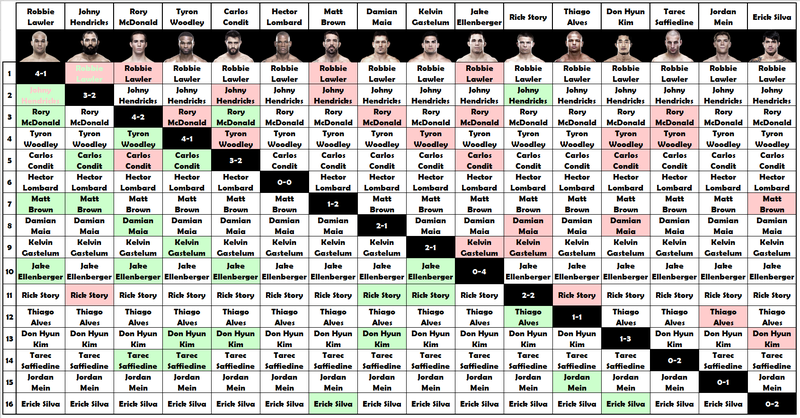 This is a new method for presenting my personal UFC rankings. I’m a very visual person so I always prefer seeing images as opposed to just words. I’ve selected the top 16 fighters in each of the UFC’s 10 weight classes. 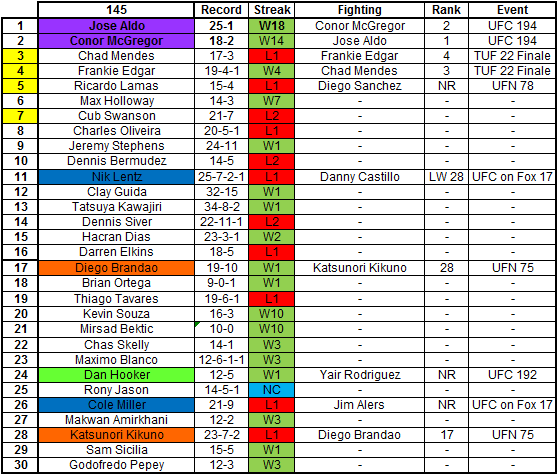 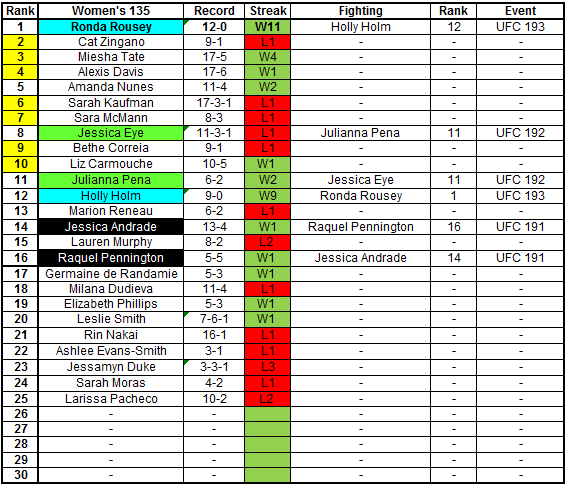 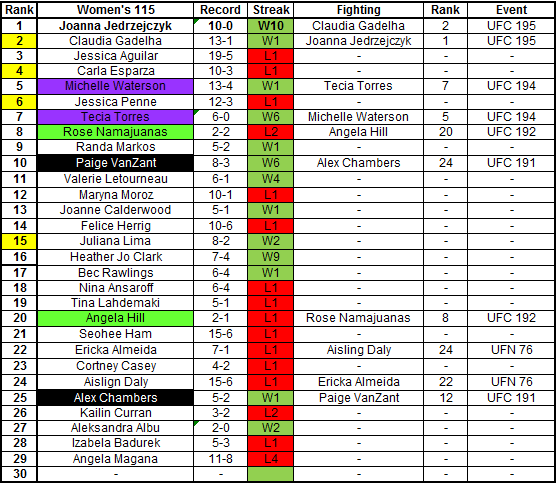 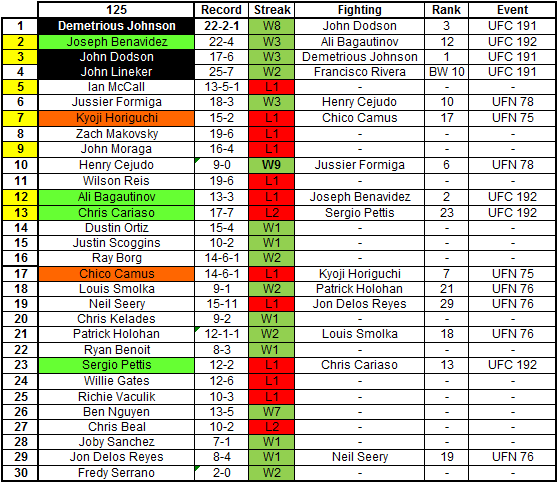 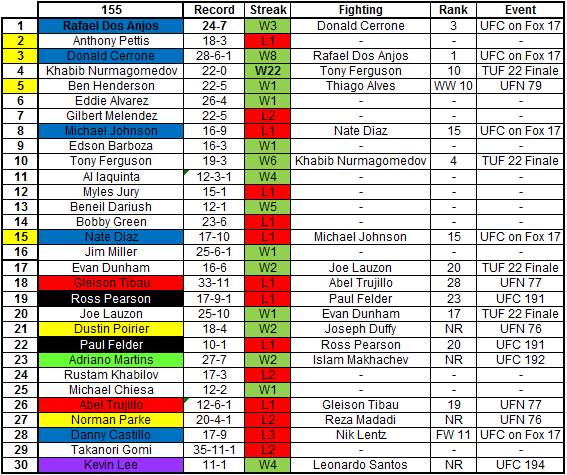 I have also included each fighters record against their fellow ranked opponents. I think this method is very useful at illustrating the “pecking order” in each weight division as well as the dominance of the respective champions. * I included the fights from the 20th Season of the The Ultimate Fighter even though they were technicaly “Exhibition” matches because they were part of the tournament that crowned the inaugural champ. Tonight is UFC 186. 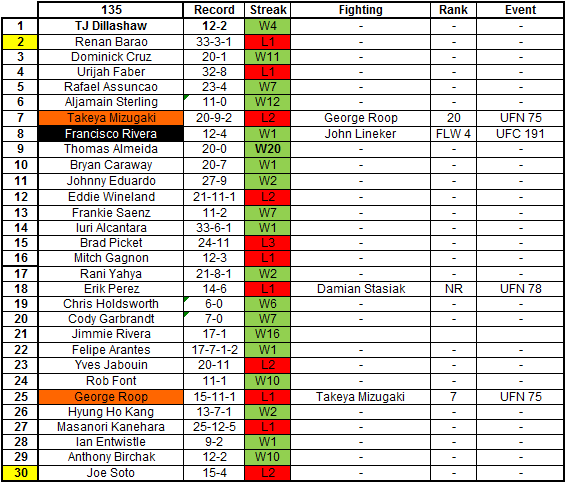 I know I haven’t posted anything in a while. To be completely honest, I’ve been procrastinating, I have a ton of articles that are half written but I haven’t posted anything and it’s become a bad habit. Since there’s a UFC Pay Per View tonight, I figured I would post my fight picks to at least get back in the habit of writing articles for the site. This isn’t really the UFC’s best PPV card, but it should still be a fun night of fights. It’s always a pleasure to watch a master like #1 Demetrious Johnson at work, plus it’s exciting to see #9 Rampage Jackson back in the UFC in a fight that is guaranteed to be a war. 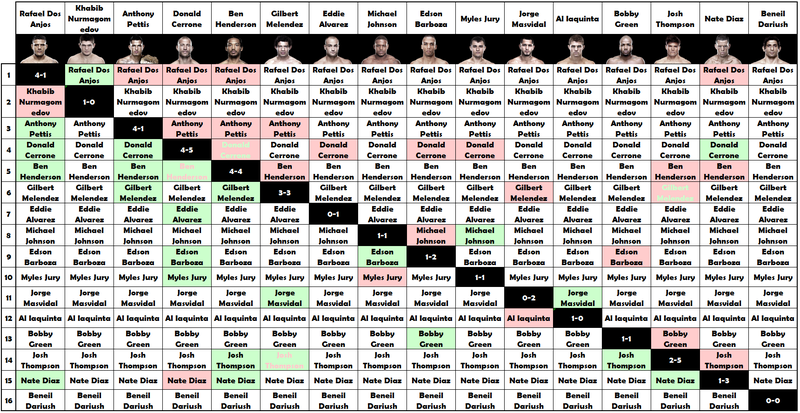 I don’t know how accurate my fight picks will be, but I’m looking forward to tonight anyways hahaha. 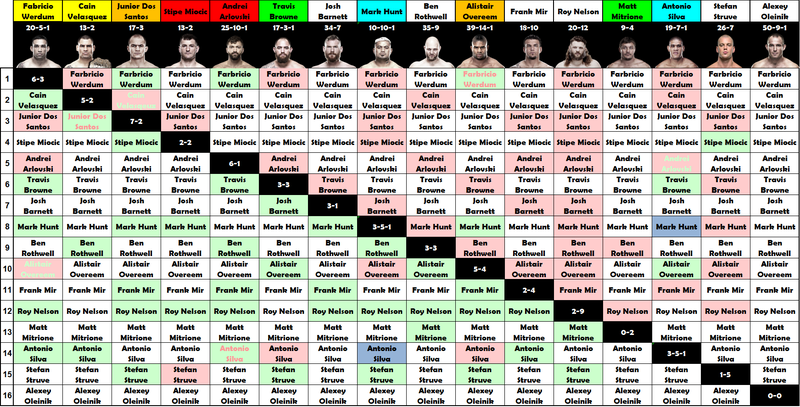 The prelims just started so this is very very late, but better late than never hahaha. UFC 185 is what I like to call a stacked card. 2 title fights, and plenty of top ranked fighters, I can’t wait. Let’s see how many I get right this time.